“When we celebrate, we are very serious about celebrations and enjoy celebrations. Walang celebration kung walang music, dancing, or prayer of thanks (There is no celebration if there isn’t any music, dancing, or prayer of thanks),” enthused Department of Education Secretary Leonor Briones as she addressed teachers from all over the Philippines who converged in Ormoc City, Leyte for the annual celebration of National Teachers Month. Teachers receive treats and other goodies at the Pepsi booth. As one of the strongest partners of DepEd, Pepsi-Cola Products Philippines Inc. readily accepted the government agency’s request to help support the culmination of National Teachers Month on Oct. 5. The bottling firm sponsored the celebration, providing treats and prizes for the hailed second parents of Filipino schoolchildren. “We have been a long-time partner of DepEd and we eagerly celebrate the value of our teachers who sacrifice so much in the shaping of our nation’s future,” said Monique Castro, corporate affairs and communications senior manager of PCPPI, whose yearly Brigada Eskwela and school feeding programs punctuate their regular partnership with the government organization. Aside from supplying free goodies to teachers all throughout the day, PCPPI also encouraged teachers to show off their gifts through a talent show that highlighted their hidden skills outside of the classroom. 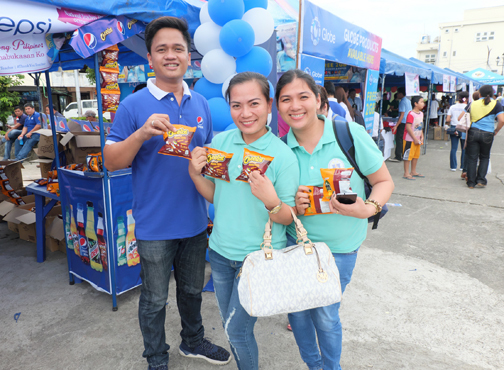 The beverage giant made sure they enjoyed themselves with engaging activities and games where they can win prizes and have a good time, all while being refreshed by their favorite Pepsi products. Since its launch in 2008, the DepEd has elevated the usual teacher’s day celebration normally held in schools into a national celebration for educators nationwide. This year’s theme, “Gratitude In10sified” highlighted 10 successful years the government and its partners in the private sector celebrated teachers through National Teachers Month. DepEd Undersecretary Tonisito Umali recalled the humble observance National Teachers Month started with and beamed how it has now grown for 6,000 teachers in its host city, the biggest celebration thus far.